8 Responses to Demo Glove Winner: Stop, Hammer Time! Looks like you should send some safety glasses too. I don’t know, I have a 5 year old and a 3 year old and they don’t need ANY tools to destroy a room. I don’t really care if dad wants to be a dumbf***, but the kid should have protective gear: gloves, safety glasses, and a dust mask. Like everybody else is saying. Where are the safety glasses?!?! Ditto on the Glasses, Dust Mask and Dumbsh*t. Can you say lead and permanent disability? As an ex behavior specialist, this kid was money in the bank for me. 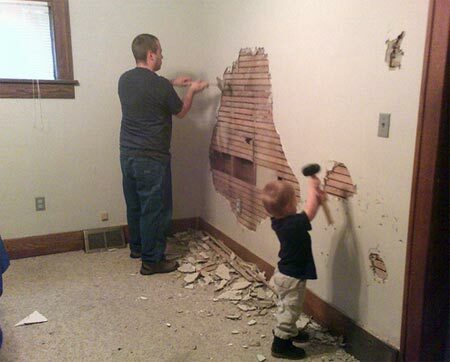 If his dad lets him “help” a lot, he’ll have the attention span of a fruit fly. Hey, I’m still waiting for those gloves. Did you know plaster can have a 2% asbetos content. It is also pretty much guaranteed to be painted with lead paint. Lead and asbestos exposure especially to the young is horrible. While someone who already has a fully developed brain and nervous system may not have too much issues with lead exposure, it is unbelievable that someone would expose their child to this or to possible asbestos. I hope this is only a photo op and the child wasn’t exposed for a very long time.